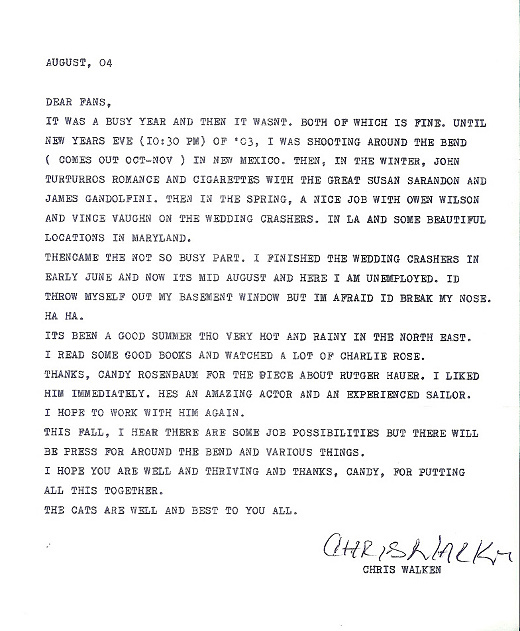 Here we have a pleasant, charming letter from the living legend that is Christopher Walken, a man with one of the most distinctive voices in Hollywood, typewritten to members of the Online Christopher Walken Fan Club in 2004 via its co-ordinator, Candy Rosenbaum. According to Ms Rosenbaum, the actor, apparently a technophobe, makes a concerted effort each year to keep in touch with his fan-base. 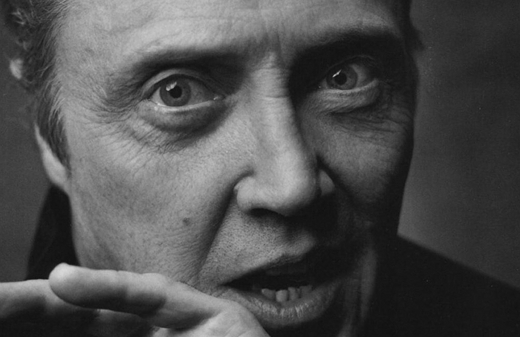 Before beginning, please be aware that you will read the following letter slowly, in the voice of Christopher Walken. IT WAS A BUSY YEAR AND THEN IT WASNT. BOTH OF WHICH IS FINE. UNTIL NEW YEARS EVE (I0:30 PM) OF '03, I WAS SHOOTING AROUND THE BEND ( COMES OUT OCT-NOV ) IN NEW MEXICO. THEN, IN THE WINTER, JOHN TURTURROS ROMANCE AND CIGARETTES WITH THE GREAT SUSAN SARANDON AND JAMES GANDOLFINI. THEN IN THE SPRING, A NICE JOB WITH OWEN WILSON AND VINCE VAUGHN ON THE WEDDING CRASHERS. IN LA AND SOME BEAUTIFUL LOCATIONS IN MARYLAND. THENCAME THE NOT SO BUSY PART. I FINISHED THE WEDDING CRASHERS IN EARLY JUNE AND NOW ITS MID AUGUST AND HERE I AM UNEMPLOYED. ID THROW MYSELF OUT MY BASEMENT WINDOW BUT IM AFRAID ID BREAK MY NOSE. HA HA. ITS BEEN A GOOD SUMMER THO VERY HOT AND RAINY IN THE NORTH EAST. I READ SOME GOOD BOOKS AND WATCHED A LOT OF CHARLIE ROSE. THANKS, CANDY ROSENBAUM FOR THE PIECE ABOUT RUTGER HAUER. I LIKED HIM IMMEDIATELY. 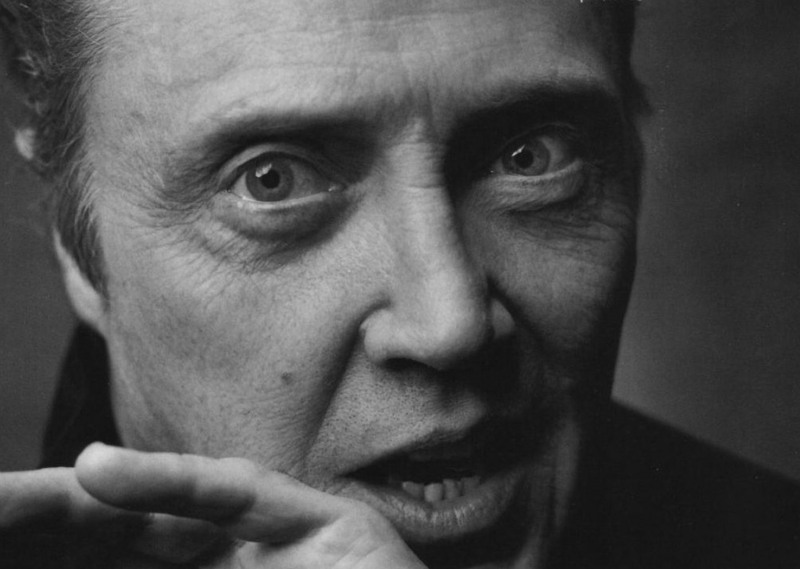 HES AN AMAZING ACTOR AND AN EXPERIENCED SAILOR. I HOPE TO WORK WITH HIM AGAIN. THIS FALL, I HEAR THERE ARE SOME JOB POSSIBILITIES BUT THERE WILL BE PRESS FOR AROUND THE BEND AND VARIOUS THINGS. I HOPE YOU ARE WELL AND THRIVING AND THANKS, CANDY, FOR PUTTING ALL THIS TOGETHER. THE CATS ARE WELL AND BEST TO YOU ALL.